Three friends push the boundaries of trust in this hermetically sealed shocker from the creaters of Trainspotting. Starring Kerry Fox (The Hanging Garden), Christopher Eccleston (Elizabeth) and Ewan McGregor (Star Wars: The Phantom Menace), Shallow Grave is a masterpiece of terror riddled with hairpin turns that takes you on a fantastic ride to the lowest depths of human nature. Juliet (Fox), David (Eccleston) and Alex (McGregor) find that their new reclusive roommate has not left his bedroom for days. After kicking in the door they discover this drug over-dosed corpse... and a suitcase full of money! Fatefully choosing to keep the money they know they have to get rid of the remains. But the body won`t stay buried and a careless trail from the shallow grave leads the police - and two money hungry thugs – back to the trio. And as the stakes get higher, so does the body count, not to mention their paranoia which is quickly putting their friendship in jeopardy... forever! I first saw this film on T.V a few years ago and loved it, so I was obviously pleased to discover it was on DVD. The film itself is very good and without a doubt one of the best British films out there, the transfer is fair although could have been better and I`m afraid there are no special features apart from a grainy trailer but it`s still worth a look. "Shallow Grave" is the movie that asks the question can three bored, young professionals who share a flat find happiness if they find a dead body and a suitcase full of money. This movie is fascinating and has a whole series of great plot set ups. The filming is imaginative and takes many risks. The actors and actress are good with the exception of McGregor who does Alex as the standard obnoxious character you have seen done many times before. Set in Edinburgh though largely shot in Glasgow, the story begins with three cocksure 20-something professionals - doctor Juliet (Kerry Fox), accountant David (Christopher Eccleston), and reporter Alex (McGregor) - treating a succession of prospective flatmates to a merciless stream of abuse. They finally give their spare room to Hugo (Keith Allen), a smooth stranger who promptly dies the next day. Beneath his bed sits the aforementioned suitcase - the catalyst for a brutal tale of murder, madness, and dismemberment. Soon, gangsters start looking for the missing Hugo, coming ever-closer to our heroes. The police start closing in, and to make matters worse, each character begins to lose his or her light-hearted sensibility, becoming more neurotic, sinister, or traitorous as the net tightens. Steel yourself for the unthinkable ending--it`s beyond even the famed hypodermic needle scene from Pulp Fiction. 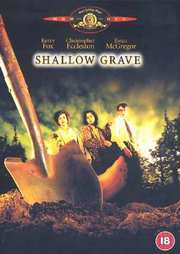 "Shallow Grave" has all the elements of a great thriller. It`s not perfect, but it`s close. Director Danny Boyle has learned the best secrets of filmmaking, mainly from Alfred Hitchcock. On one hand the story is disquietingly real and straightforward, but at the same time it`s deeply intriguing. The team would reunite a year later for "Trainspotting" - but that`s a different story.